The dive site 13th Apostle is an offshore rocky reef in the Llandudno area on the Atlantic seaboard of the Cape Peninsula, near Cape Town in the Western Cape Province of South Africa. This granite reef and pinnacle has been known to exist for many years, as there is a break over it in a large swell, but no details were reported until an exploratory party visited it on 3rd October 2010, to investigate what had shown up on a side-scan sonar image from a reef survey by the Council for Geoscience as a massive mound of rock. What they found is a huge granite corestone tor with a vatiety of interesting topographical features, on a low profile rocky bottom with sand patches. The name "13th Apostle" is a reference to the position at the end of the mountain range called the 12 Apostles, south of Table Mountain. Visibility is variable, and can be in excess of 15m on a good day. 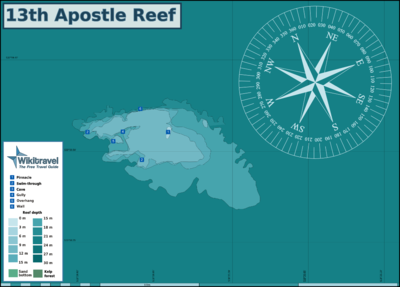 At 18m the reef extends about 200m from north west to south east. The top of the reef is a ridge running roughly true east-west, and approximately 10m deep on the crest, which is broken, but quite long. Towards the east side of the ridge is a peak which is about 6m deep on top. There are several small sand patches in the immediate vicinity, visible in good conditions from the ridge, and a few larger ones further away to the north east, south and west. The bottom is at roughly 23m on the sand patches near the main reef. The north side is fairly sheer, dropping almost vertically from near the top to about 20m, possibly lower in places, and is undercut at the east end by an overhang close to the bottom. At the west end of the reef there is a large swimthrough with a high, narrow entrance at S33°59.490' E18°19.902'. at roughly 18m depth at the top and about 3 or 4m high and only about 600mm wide at the widest point near the top. The entry to the east is about 2m square, and is somewhat deeper and at the bottom of a wide crack. The cavern inside is over 3m wide and high, and is about 10m long and is formed by a huge boulder covering the top of a bug crack with a sand bottom. To the north of the widest part there is a skylight crack, a couple of metres long and possibly wide enough for a thin diver to get through. Both entries are not obvious. you need to look for them to find them. Further around to the south-east the reef is flatter, with isolated high boulders, and there is another much smaller swimthrough at S33°59.507', E18°19.935'. The 18m contour turns north about 200m south east of the west end. Access to the site is only by boat, as it is too far to swim from shore. The top of the reef at about 10m has a fairly dense forest of Split-fan kelp, which is quite usual for this area, however thickets of this kelp are frequent down to 15 to 18m, which indicate that there is often good lighting at this reef, and that implies frequent good visibility. There is also a moderate amount of other brown seaweeds at this depth range, and rather surprisingly, some filamentousgreen algae. The deeper, more horizontal surfaces appear to be largely colonised by Cape Urchins, with olive and purple soft corals, Spiny starfish, encrusting coralline algae and brown ball sponges. The steeper, vertical and overhanging surfaces, as is to be expected, carry a dense encrustation of a wide variety of invertebrates, notable among which are sponges, Noble corals, multicolour sea fans, Red bait and other ascidians, bushy and fan hydroids, and dark sea cucumbers. Knobbly anemones, strawberry anemones, Granular sea stars, and a range of bryozoans can also be found. Other animals reported from this site include: Cuttlefish, Basket stars, Lots of different nudibranchs including Flabellina capensis , gas flame and silver tipped, and white ones with brown spots, Furry sponge crab, Kelp klipfish, Big shoals of large Hottentot seabream, and some massive rock lobster deep inside holes. There are several swimthroughs, overhangs and deep gullies, some are described in the Topography section. If the visibility is good, wide angle lenses with ambient lighting will provide some spectacular views, otherwise macro equipment with flash will almost always produce good results. The use of flash for intermediate distances should be reserved for external strobes to minimise backscatter. Even on a good day there will be some suspended material. At this stage only one route is suggested, not because of lack of things to see, but because very few of the features have been mapped. Enter at the top of the pinnacle, swim north over the wall and descend to the bottom of the wall. Swim west along or near the base of the wall at a depth of 18m until you can turn south. Look out for the opening to the big swimthrough at about 18m - it is not very wide but is quite high - if you turn southwest and find the bus shelter you have gone about 15m too far. Explore the swimthrough and then continue at between 15 and 18m with the reef to your left in a roughly southwesterly direction to the "Bus shelter" overhang, Enjoy the view if the visibility allows, and then if you want to look for the smaller swimthrough, continue along the 18m contour. The smaller swimthrough is in a small indentation in the reef, and the tunnel appears to be several metres long and moderately high, but rather narrow. After this you are on your own. Explore as your time and gas allow, and work your way up the reef to extend dive time. If you find anything interesting, describe it here or on the article's Talk page. Dry suit recommended, as it will normally be cold if the visibility is good. Nitrox can significantly extend safe dive times. A DSMB and Reel are recommended to indicate your position to the boat while surfacing. This page was last edited on 7 August 2014, at 07:32.